If you're familiar with VeggieTales, then you know that Larry the Cucumber and Bob the Tomato, plus all of their veggie friends, bring positive messages to children through really fun videos! My children have been enjoying VeggieTales DVDs and videos since they were little. You know what? They still enjoy them. Why? Because now they're old enough to understand all of the jokes spread throughout the DVDs! In Merry Larry and the True Light of Christmas, Larry The Cucumber is a Christmas elf at the Spring Valley Mall who just wants to spread joy at the holidays. When he meets a little girl with a big heart whose only Christmas wish is to help a friend in need, "Merry Larry" sets off on adventure that will light up the holidays like never before and show the town of Spring Valley what Christmas is all about - "Christmas shines most bright and true when you give the love God gave to you!" Merry Larry and the True Light of Christmas features Si Robertson as Silas the Okra! If you're a Duck Dynasty fan, you're in for a hoot of a good time! We had a lot of fun watching this new VeggieTales DVD, and I know you will, too! What's also fun is that for your younger ones in your family, there are some high quality coloring pages to print off and share with your kiddos! Click on the coloring page image below to download some coloring fun! New giveaway ends January 10th! I received a copy of the Larry Merry and the True Light of Christmas DVD for review purposes, but was not compensated financially in any way. The opinions expressed are my own and are based solely on my experiences while watching this movie. I am disclosing this in accordance with the Federal Trade Commission's 16 CFR, Part 255: "Guides Concerning the Use of Endorsements and Testimonials in Advertising." Christmas Peace - Share your faith with these FREE printables! Amid the long lists of people to visit, shopping to do, and a Santa on each corner, often the message of CHRISTmas gets lost in the busy-ness of the season. Quite a few years ago, our family chose to simplify some of our Christmas "happenings" and focus more on Christ. We began reading through a fun and meaningful series of 3 books. Arnold Ytreeide has written some wonderful Advent books that combine action-packed fictional stories set in the time of Jesus' birth with delightful, short advent readings for each night in December. These are written so well that Elmer and I have enjoyed each moment reading through them, too! We simplified our gift-giving list; we actually decided to make fewer Christmas candies and goodies; etc. This year, we are decorating our home with our traditional Christmas decorations as well as these symbols of peace that my daughter, Kelsi, and I designed. People have seemed to enjoy the free October Autumn PumpkinScripture printables we made for October, and the November "Leaves of Thanks" Scripture printables, so we decided to make some free printable Scripture decorations for December and CHRISTmas for you to enjoy! If you would like to print out these 3 pages of CHRISTmas Peace for your own personal family use, or in your classroom or Sunday School class, just click on the page, below. White or cream-colored cardstock works well for printing these three pages. If you desire, feel free to laminate them for future use. Merry CHRISTmas to you and your family! Please remember that these CHRISTmas Peace printables are copyrighted and are not to be shared on another website without permission from Joy In Our Journey.com. Thanks! 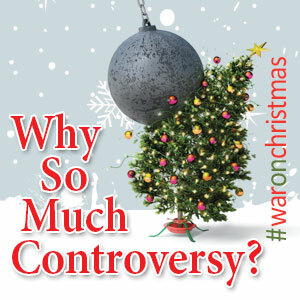 The War on Christmas: What in the World? These two words, in my mind, don't go together. My Christmases throughout my childhood and adult years have been times of peace, not conflict. Did you know that Christians are now seeing conflicts surrounding Christmas? ...employees refusing to say "Merry Christmas" but instead, "Happy Holidays"
...writing X-mas instead of "Christmas"
The War on Christmas: Battles in Faith, Tradition, and Religious Expression is a book designed to confront the arguments and conflict surrounding Christmas. At first, my thought was, "Here we go, another book on all of the reasons why Christians shouldn't have a Christmas tree, hang stockings, etc., etc., etc." Well, I was wrong. This is an excellent book, one that my family is reading through in our evening Bible devotional times together. My husband is enjoying this book so much, that he is also teaching about the misconceptions and conflicts surrounding Christmas in our adult small group class on Sunday mornings about church, using this book as one of the helpful resources in his studies. What is the significance of the name "Jesus"? "Jesus", the name, comes from the roots of the Hebrew language and means "Jehovah is salvation," and "God our Savior". Wow. What a powerful name! Did you know that the male name, "Joshua", is also a form of the word "Jesus"? Chapter 14 of The War on Christmas pinpoints various Scripture verses from both the Old and the New Testament and shows why the genealogies of Jesus' family history are actually listed in the Bible. There are important elements we can learn from reading through and studying these genealogies! Every part of the Bible is inspired by God and has an important purpose. You'll get a glimpse of the many prophecies surrounding the Messiah and why Jesus is the only God-man who has ever fulfilled all of those prophecies. This video, below, shows some of the misconceptions Americans have about the birth of Christ. I found this interesting! ...Emmanuel, God With Us, Blessed Redeemer, Living Word. Those are all some amazing names of God. If you have junior high or high school youth in your home, this book could be an excellent choice to explore together as a family. Whether you are excited about celebrating Christmas, or you feel it is a sin to celebrate Christmas, I think you will appreciate much of the material in this new book. We have! You may find that it's easier for each person to have their own copy to read and follow along as everyone takes turns reading from the book. This particular book, we've found, is easier to read in a quiet moment than to listen to it being read from in a small group. It's also great for creating discussion that leads to growth! We are learning some new things about the Scriptures, and that's always great! I received a copy of The War on Christmas for review purposes, but was not compensated financially in any way. The opinions expressed are my own and are based solely on my experiences while watching this movie. I am disclosing this in accordance with the Federal Trade Commission's 16 CFR, Part 255: "Guides Concerning the Use of Endorsements and Testimonials in Advertising." The saying is, "What goes around comes around," and sometimes I find this to be true in little things in my daily life! Last night, while visiting with my parents - who blessedly live only about 10 minutes away from my family - my mom asked if I would be dropping no-longer-wanted items off at Goodwill or Salvation Army anytime soon. ...until I saw what she was giving away. Oooh! I know she hasn't used these Pyrex glass dishes for over 20 years now, but this is the kind of thing I've been storing our leftovers in the last few years. I still use a few high quality plastic containers, but I prefer to use glass, porcelain, or ceramic containers these days. I haven't yet broken any canning jars, but I have chipped and broken other glass and ceramic containers. I'm a clutz in the kitchen - sadly. You know, it's funny. The glass dishes from my mom were the rage when my mom married, over 50 years ago, and then went "out of style" as Tupperware and plastics became the "in" thing. My oldest Tupperware containers date back to 1990 or so. I really don't prefer to use them anymore. Some of them "feel" old and weird or are slightly almost "sticky" to touch; some of them contain BPA and other chemicals that are now banned in plastics that contain foods. Some of them have lids that have cracked or no longer hold a tight seal. Others let in pantry moths that I dealt with about a year ago...which is why most of our foods are now stored in gallon sized glass jars with tight screw-on lids, or smaller sized canning jars with tight plastic lids. I'm thrilled to begin using my "new to me" Pyrex glass storage containers! They won't work well to transport leftovers for my husband's lunchtime at work, but they'll work well in our fridge. Yes! If you're interested in switching your plastic storage over to glass options, you don't have to do it all at once. You can check your local second-hand stores, find glass/ceramic/porcelain storage options at garage sales, and just gradually replace your old plasticware with healthier storage options for your foods. Like the looks of these Pyrex storage containers? There are quite a few new options for glass storage now, some with really tight sealing lids. Nice! How old are your oldest plastic food storage containers? A few of my favorite things...The Sound of Music! My endearment toward the musical, "The Sound of Music", goes clear back to when my twin sister and I were babies...and when our little brother joined our family when we were 2-1/2 years old. Guess what song my parents sang to us each night when they tucked us into bed? As a junior higher, I loved playing music from my mom's The Sound of Music piano book. Some of the songs were a bit too difficult for me, but I still enjoyed trying to play them. Now my daughter, Brittany, has fun playing out of the same book! When I heard that NBC was going to remake The Sound of Music, I was skeptical - yet curious. What I didn't realize at first was that this was going to be a LIVE event, on stage, as if I was sitting down in my living room, watching a live Broadway show! Wow. There will be no "Take 2" on Thursday night. That takes courage these days! Hmm...can anything top the original movie? The acting? The original soundtrack? Well, I decided to find out. I watched The Making of The Sound of Music Live to see if I could get any clues about whether or not the new, live version would be worth my time. I really enjoyed seeing the casting of the characters take place. As far as the actual acting goes, I can't really tell. I'll have to wait until Thursday night to find out...but the dancing looks wonderful! The "new" von Trapp children! After listening to portions of the songs from The Sound of Music on iTunes (not an affiliate link), I can wholeheartedly state that I believe the new music is as good as the original. It is simply beautiful! I'm so excited about watching The Sound of Music - LIVE this Thursday that I've invited some friends over to have a The Sound of Music LIVE Viewing Party with me. Fun! I'd love to let you in on what I have planned for that night, including dinner, but I don't want to give it away to my friends just yet. So stay tuned! I'll be sharing here how we celebrated the release of this new classic musical with our friends. Here's a little preview of the upcoming LIVE broadcast this Thursday evening, December 5th at 8 p.m. (7 p.m. Central) on NBC. I hope you can work The Sound of Music - LIVE into your evening on Thursday! Let me know what you thought of it. Since my daughter, Brittany, has been obsessed with all things Japanese for quite a few years now, I'd heard of matcha powder. We actually bought some about a year ago and used it to make matcha ice cream. While she wasn't able to use matcha powder in her cooking contest at the county fair a couple of years ago, she enjoyed using it at home. Brittany dressed up for the county fair "Tablesetting" contest! Brittany's Japanese-themed table she decorated. I'm not the one to run after the latest health craze (or any craze at all...there's a reason why it's spelled C - R - A - Z - ...well, you get the picture, right?). But we have used matcha powder in our home. So, what IS matcha? Is this just one of those disturbing health trends that will be here today, gone tomorrow? Matcha, also spelled maccha, is the name for finely milled or finely powdered green tea. Most commonly used in Japan, the Japanese tea ceremony centers on the preparation, serving, and drinking of matcha. In modern times, matcha has also come to be used to flavor and dye foods such as mochi, soba noodles, green tea ice cream, and a variety of wagashi (Japanese candies). The current practice of drinking powdered green tea in the Japanese tea ceremony actually originates from the Song Dynasty in China, which dates back to over 1,000 years ago. This practice was carried on in Japan and is now considered a pillar of Japanese culture. Today, high quality Matcha is being made in China as well as Japan. What can Matcha do for your energy level and health? Matcha provides 4 to 6 hours of mild steady energy as it acts as both a stimulant and a relaxant. This is ideal for focusing on whatever comes your way throughout the day. Consuming matcha green tea can increase your body's rate of burning calories from a normal 8%-10% of daily energy expenditure, to between 35% and 43% of daily energy expenditure. ​Scientists have discovered that Matcha Green Tea helps protect the skin from harmful UV rays. Matcha also improves blood flow and oxygen levels, lifting the overall health of the skin. The most recent brand of Matcha Green Tea Powder our family has used is by Kiss Me Organics. I like the fact that it has been organically grown and prepared for culinary use! It's simple to use: just open up the package and measure out a small amount, from 1/4 tsp. to a couple of teaspoons in recipes. While it may seem expensive for one pouch, it lasts quite a while since such a small amount is used per recipe. We used Kiss Me Organics Organic Matcha to make Sparkling Matcha (a non-alcoholic beverage) to accompany our Pan-Fried Matcha Chicken for dinner. See my recipes below! This Pan-Fried Matcha Chicken was so delicious! All four of us just loved it and were very sorry we didn't make more! 1. Cut chicken breast down the middle, or butterfly it so it has a more uniform size. 2. In a shallow bowl, combine almond flour, cayenne pepper, matcha, cumin, salt, pepper, and lemon zest (or 1 tsp. lemon pepper). 3. Place gently whisked egg in second shallow bowl. 4. Dip each piece of chicken into blended egg. 5. Dredge egg-coated chicken through the almond flour/seasoning mixture until it is completely covered. 6. Add oil of your choice to a large skillet over medium-high heat. thermometer reads 175° - 180° F, depending on how thoroughly cooked you prefer your chicken. 8. Transfer to a rack or plate with paper towels to drain excess oil. Matcha green tea powder has a unique taste. While I enjoyed the lime/matcha combination, not everyone at the dinner table favored it. 1. In a tall glass, stir warm water, matcha, and a sprinkle of salt until blended. 2. Add ice cubes to glass and slowly add sparkling water. 3. Stir until blended and squeeze lime wedge on top (or add lime juice). 4. Blend in stevia extract or liquid stevia drops, to taste. 5. Taste and add additional lime juice, salt, and/or stevia, until it's just right for you. Kiss Me Organics is providing a FREE download of their recipe book right now! This enables you to have access to some really amazing recipes for drinks, smoothies, breakfast, meals, and desserts! Just click on the recipe book image on the left, or the "FREE download" link, above. I thought you should know about Kiss Me Organics' current "BUY ONE GET ONE 50% OFF" sale promotion on Organic Matcha Green Tea Powder right now, for a limited time. In order to receive a second bag of Matcha Green Tea Powder for free, you will need to place 2 bags of Kiss Me Organic Matcha Green Tea Powder into your shopping cart on Amazon.com for this promotion to work. Be sure to enter code 4PAMQUFS at checkout. In summary, there are so many health benefits to adding matcha to your diet! With this free recipe book from Kiss Me Organics, you'll find many new uses for delicious green tea matcha. Some people may need to acquire a taste for matcha, while others will enjoy it the first time they try it. It is a unique flavor that I enjoyed back in 1993 when I traveled in Japan with a group of fellow teachers, and I'm enjoying trying new recipes so I can begin to incorporate matcha into our regular meal plans. Yum!